PHUKET: Phuket province, a traditional bastion for the Democrat Party, has fallen, with voters instead electing candidates from the pro-military Palang Pracharath Party in yesterday’s national election, according to unofficial results announced the morning (Mar 25). The notice announcing the unofficial results published this morning (Mar 25). The Democrats lost both Phuket Member of Parliament seats available, reported a notice issued by the Committee of the Phuket office of the Election Commission (PEC). 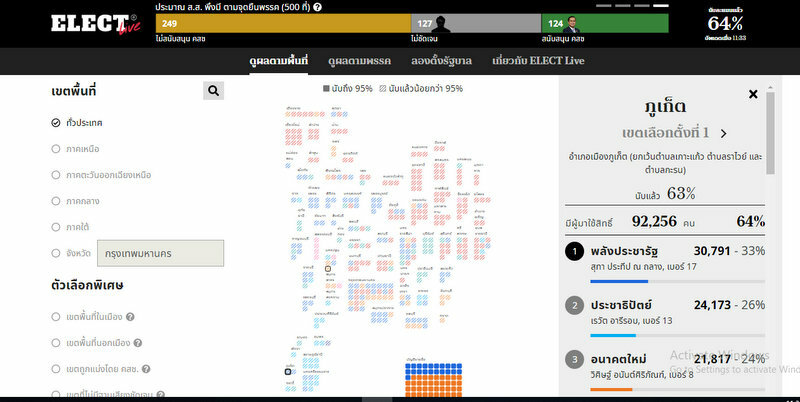 According to the notice, the unofficial tally shows that Suthapathip Na Thalang of the Palang Pracharath Party won the seat for Phuket Constituency 1 with 32,338 votes. Phuket Constituency 1 comprises Mueang District, including Rassada, but excluding Koh Kaew, Rawai and Karon. 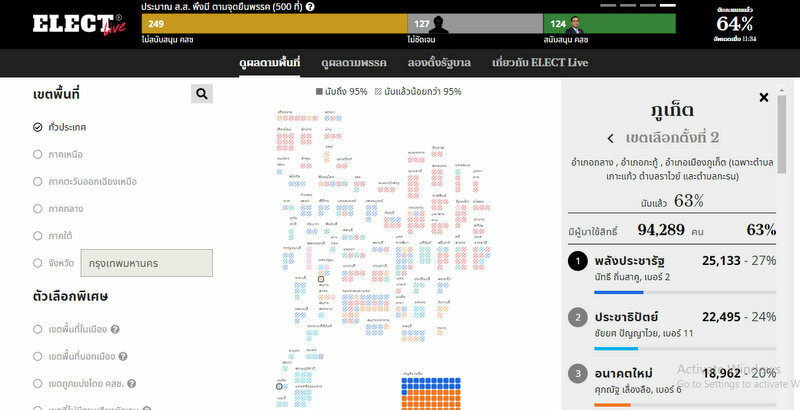 Raywat Areerob of the Democrat Party placed second with 25,194 votes, while Wisit Anansiriphan of the Future Forward Party placed third for the seat with 22,599 votes. A total of 102,466 of the 144,722 eligible voters in Phuket Constituency 1 turned out to cast their votes, a turnout of only 70.80%, said the report. There were 3,048 spoiled ballots (3.26%) among the votes cast and 2,932 of the ballots were submitted blank (2.86%), the report added. However, the notice did not specifically confirm that the resulting figures given provided for 96,486 valid votes cast in Constituency 1. The Democrats also lost in Phuket Constituency 2, which comprises the remaining areas of Thalang and Kathu Districts, but also includes and Koh Kaew, Rawai and Karon (see ECT map here), said the report. Nattee Tinsakhu of the Palang Pracharath Party won the seat with 27,267 votes, ahead of Democrat candidate Chaiyot Panyawai, who secured 23,958 votes. Supanat Leungluea of the Future Forward Party placed third for the seat with 19,963 votes. A total of 108,500 voters of the 149,511 eligible voters turned out to cast their votes in Phuket Constituency 2, said the report. There were 4,883 spoiled ballots submitted in the poll and 3,124 ballots were left blank, with a confirmed 100,493 valid votes cats in the district, the report said. The notice announcing the unofficial results was issued this morning via the Phuket office of the Public Relations Department. The PEC has yet to publish any notices regarding the vote count from yesterday. 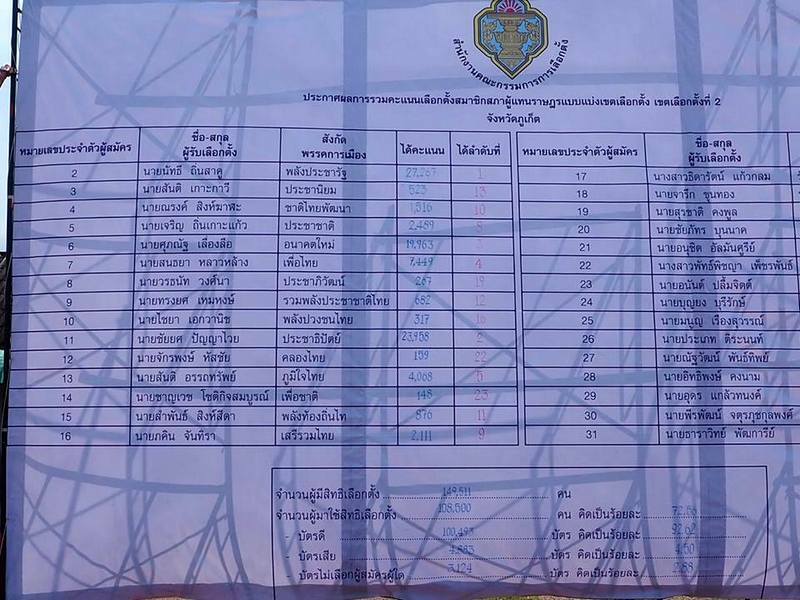 Oddly, the notice issued this morning was issued as reported by the district counting centre for Phuket Constituency 2, which was based at Thalang Phranangsang School in Thalang. 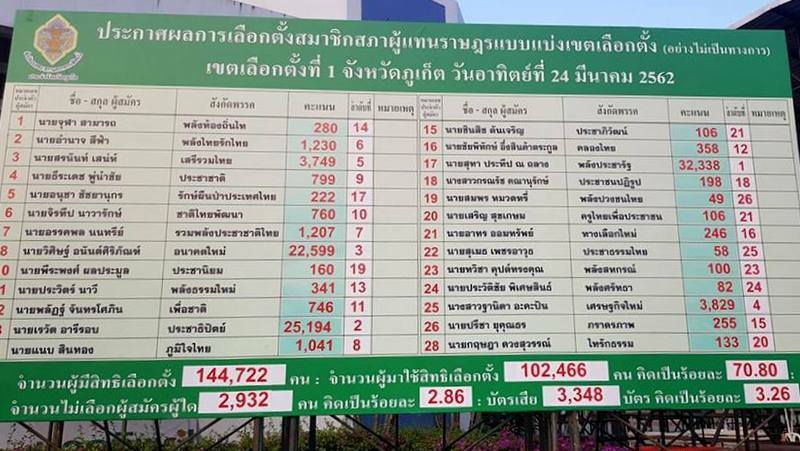 No information regarding the vote count has come from the district counting centre for Phuket Constituency 1, which was set up at Saphan Hin, and has for decades been the focal point for accumulating the vote count across the island in elections past. Despite assurance the vote count would be quick and efficient, people gathered at Saphan Hin last night were left past midnight still wondering what the results were – the worst attempt at publicly announcing the vote count in recent memory. 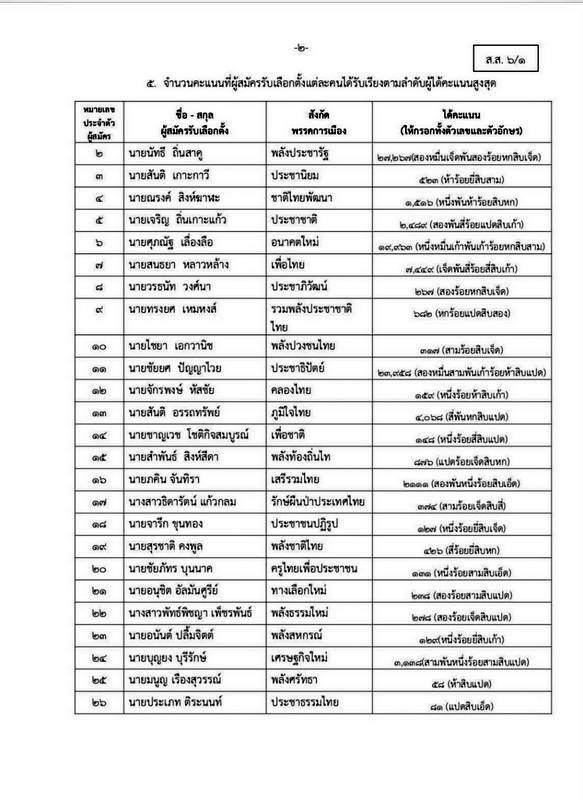 Also, the notice announcing the unofficial results published this morning was left unsigned by the three signatories named on the official notice: Somprat Prabsongkram, President of the committee overseeing the district vote-counting centre in Phuket Constituency 1; Pol Col Teerawat Liamsuwan; and Thammanu Wanwichaikul. On the eve of the election, PEC Director Nutthawat Wongitsaraphap explained, “After the polling stations close at 5pm, the head of each polling station will count the ballots on site and report the results through the ‘rapid report’ app developed by the ECT. “The app is safe and secure,” he assured. PEC Director Nutthawat is expected to make a public announcement on that issue later this afternoon. So much for the survey that said there would be a 97% turn out. Can someone explain why this election took place? Looks like the people voted to keep the military in power and the coup leader will continue as the so called PM. What a total waste of time, Are Thai people really ready for true democracy?